Pupusa revuelta at La Plancha. 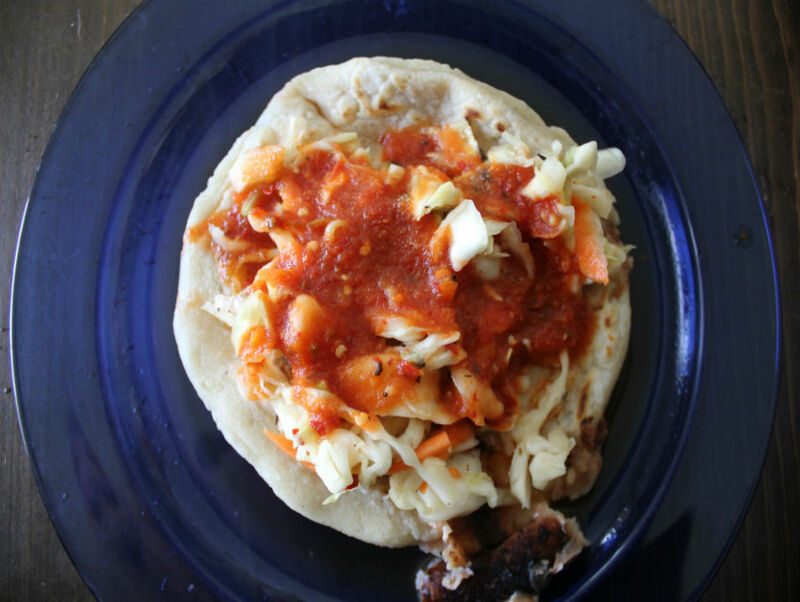 Since the 1980s, pupusas have been a Los Angeles staple for both expat Salvadorans and the ever-growing community of hungry Angelenos willing to venture out to our various cultural enclaves for delicious and inexpensive thrills. And while it’s hard to find a local food lover who hasn’t tried a pupusa, it’s likely they’ve never been to an actual pupuseria. Most of the places in L.A. calling themselves pupuserias are restaurants that just happen to serve the stuffed masa cakes alongside a full menu. But at Koreatown’s La Plancha, it’s all about the pupusas. Restaurant pupusas are not the same as those corn masa cakes leaking cheese onto the flat top, leaving splotches of grease burnt into the dough. When people used to ask me where to get pupusas, I’d also always tell them to go find a Salvadoran Pentecostal church. They’re everywhere in South Central—there’s even one across the street from Square One dining—but now I direct them towards La Plancha. They have been serving up pupusas since 1981, making them the first and only genuine pupuseria in L.A. It’s the kind of authentic place you might encounter in Los Planes de Renderos or Olucuilta, both popular towns for pupusas outside of San Salvador. La Plancha serves 6 different pupusas, including beans and cheese, loroco flower, and revuelta (mixed) made to order from fresh masa and served with a bright curtido (pickled cabbage) and a cool tomato sauce. These are as good as the ones that are sold by Salvadoran women in front of storefront Pentecostal churches and around MacArthur Park. There are a handful of main dishes, some breakfast items, and even a nice selection of Salvadoran and national beers like Suprema, Pilsener and MGD. That’s right, Miller Genuine Draft, which is a big hit with older Latinos—just ask your abuelo. Forget about waiting for church to let out on Sunday and head to La Plancha, where the pupusas are so good they’ll have you speaking in tongues.